The Lanier House, for decades Macon's premiere hotel, opened on June 12, 1850 at this location. Macon native and poet Sidney Lanier was a member of the inn-keeping family. With additions the hotel stretched 135 feet on Mulberry Street with a cast iron balcony running its entire length. It stood four stories tall with a cupola above and included two stores, a barbershop and a "bathing room." The structure was demolished in the 1970s. When word reached Macon on December 20, 1860, that South Carolina had seceded from the Union a celebratory crowd of 1,500 marched through the streets to the Lanier House. There they heard stirring speeches by some of the town's leading citizens. Walter A. Clark recalled, "The streets were packed with a solid mass of excited, fevered, yelling humanity. The people were simply wild for Southern independence." 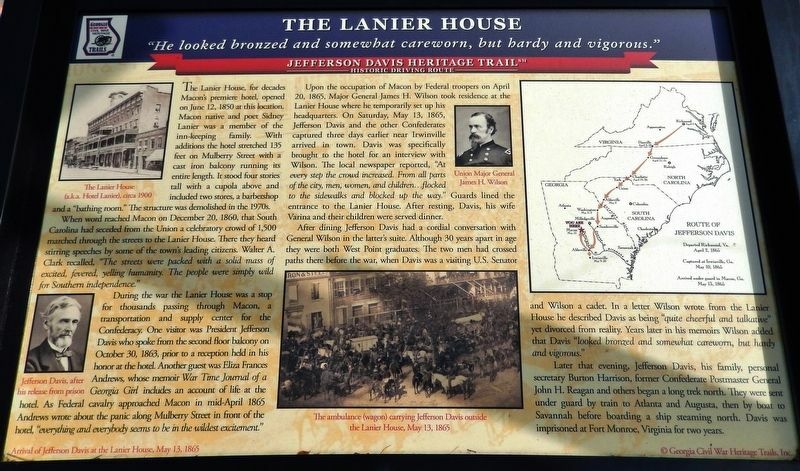 During the war the Lanier House was a stop for thousands passing through Macon, a transportation and supply center for the Confederacy. One visitor was President Jefferson Davis who spoke from the second floor balcony on October 30, 1863, prior to a reception held in his honor at the hotel. Another guest was Eliza Frances Andrews, whose memoir War Time Journal of a Georgia Girl includes an account of life at the hotel. 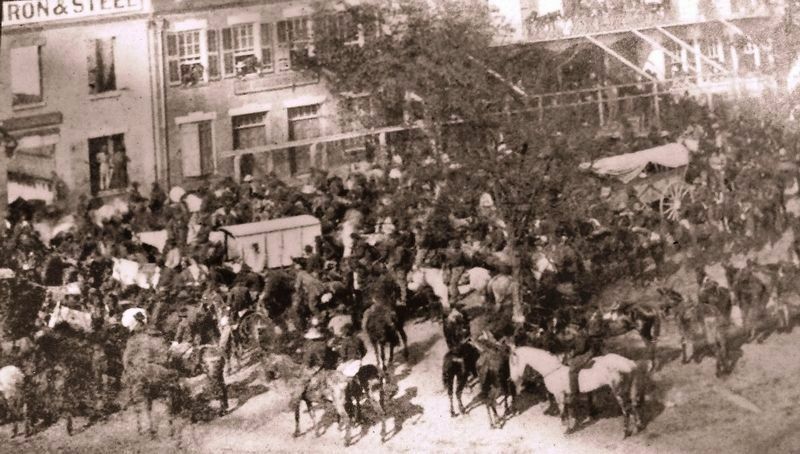 As Federal cavalry approached Macon in mid-April 1865 Andrews wrote about the panic along Mulberry Street in front of the hotel, "everything and everybody seems to be in the wildest excitement." 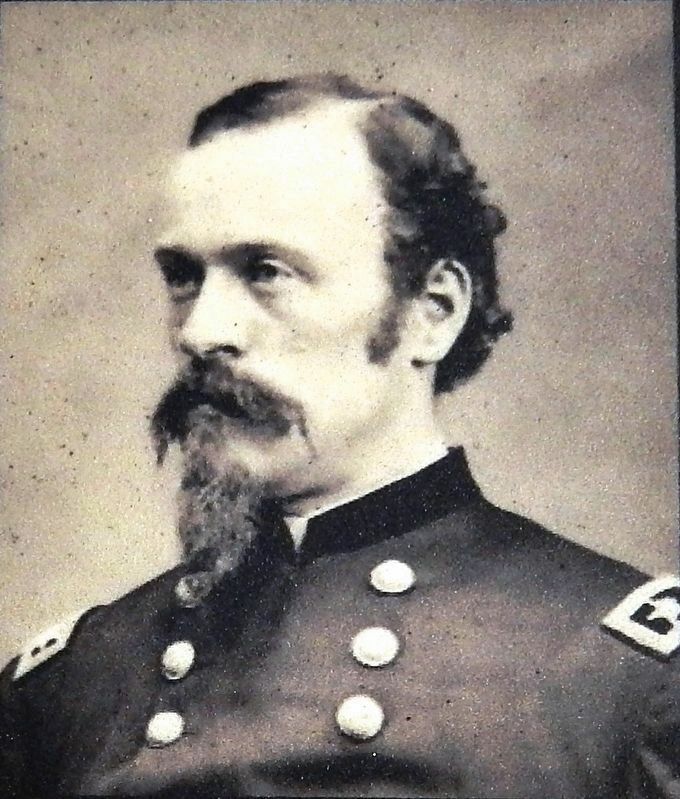 Upon the occupation of Macon by Federal troopers on April 20, 1865, Major General James H. Wilson took residence at the Lanier House where he temporarily set up his headquarters. On Saturday, May 13, 1865, Jefferson Davis and the other Confederates captured three days earlier near Irwinville arrived in town. Davis was specifically brought to the hotel for an interview with Wilson. The local newspaper reported, "At every step the crowd increased. From all parts of the city, men, women, and children… flocked to the sidewalks and blocked up the way." Guards lined the entrance to the Lanier House. After resting, Davis, his wife Varina and their children were served dinner. "quite cheerful and talkative” yet divorced from reality. Years later in his memoirs Wilson added that Davis "looked bronzed and somewhat careworn, but hardy and vigorous." 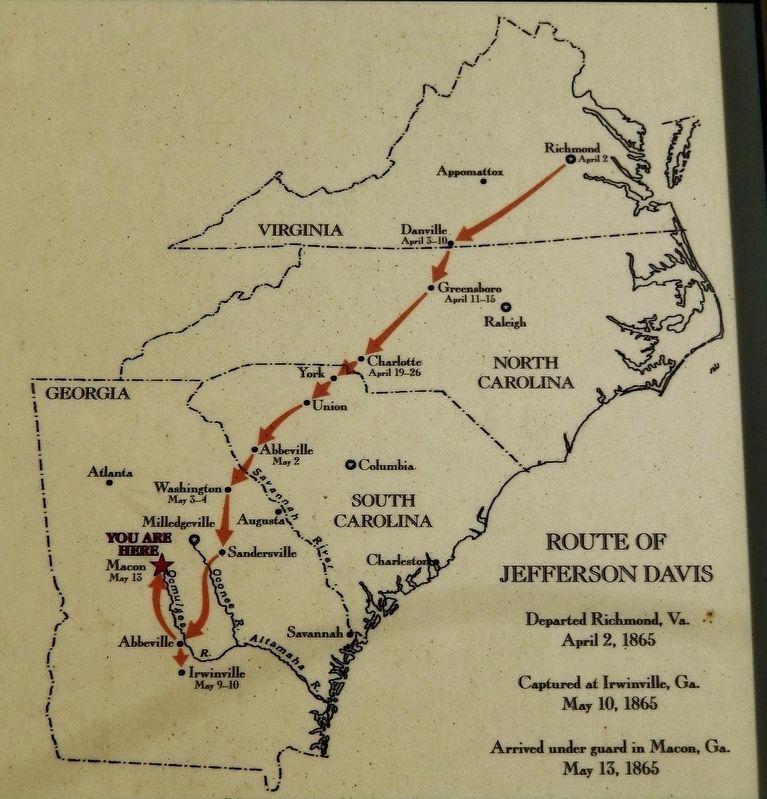 Later that evening, Jefferson Davis, his family, personal secretary Burton Harrison, former Confederate Postmaster General John H. Reagan and others began a long trek north. They were sent under guard by train to Atlanta and Augusta, then by boat to Savannah before boarding a ship steaming north. Davis was imprisoned at Fort Monroe, Virginia for two years. Erected by Georgia Civil War Heritage Trails, Inc.
Marker series. This marker is included in the Georgia Civil War Trails marker series. is located beside the sidewalk, within Messenburg Park, between the east-bound and west-bound sides of Mulberry Street. Marker is in this post office area: Macon GA 31201, United States of America. Touch for directions. Other nearby markers. At least 8 other markers are within walking distance of this marker. Wilson's Raid To Macon (a few steps from this marker); Jefferson Davis at the Lanier House (a few steps from this marker); Bibb County (about 400 feet away, measured in a direct line); Civil War Era Maconites of African Ancestry (about 500 feet away); William Augustus Bootle (about 500 feet away); First Public Camellia Show (about 500 feet away); Post 3 Macon (about 500 feet away); Christ Church (about 500 feet away). 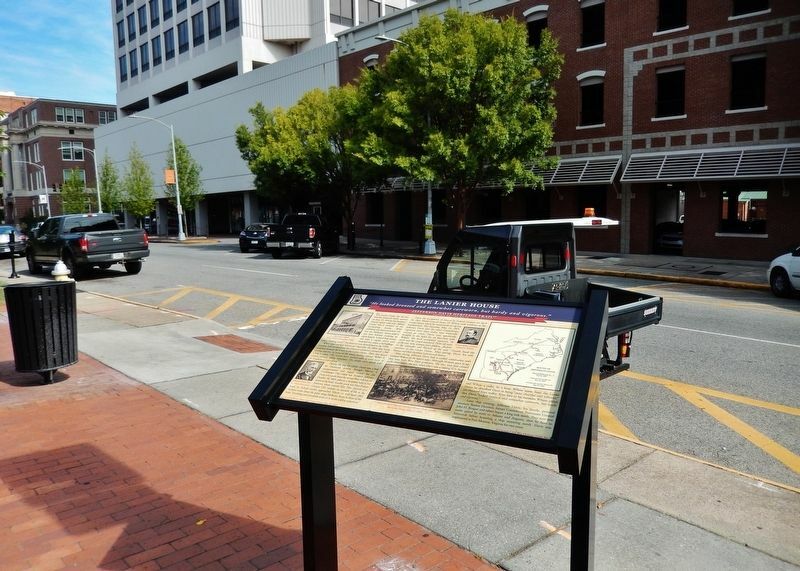 Touch for a list and map of all markers in Macon. More. Search the internet for The Lanier House. Credits. This page was last revised on March 11, 2019. This page originally submitted on March 9, 2019, by Cosmos Mariner of Cape Canaveral, Florida. This page has been viewed 76 times since then. Photos: 1, 2, 3, 4, 5. submitted on March 9, 2019, by Cosmos Mariner of Cape Canaveral, Florida.